This short post will explain how you can fetch twitter data using twitteR & StreamR packages available in R. In order to connect to twitter API, we need to undergo an authentication process known as OAuth explained in my previous post. 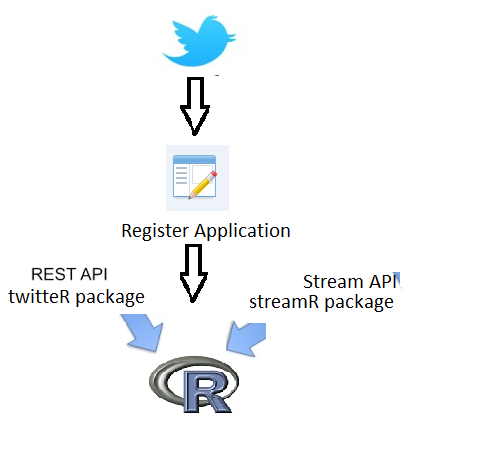 Twitter data can be fetched from twitter in two ways: a) Rest API b) Streaming Api. In today's blog post we shall go through both using Rest API & Stream API. One of the available package in R for fetching Twitter Data. The package can be obtained from here. This package allows us to make REST API calls to twitter using the ConsumerKey & ConsumerSecret code. Code below illustrates how as how to extract the Twitter Data. Register your application with twitter. After registration, you will be getting ConsumerKey & ConsumerSecret code which needs to be used for calling twitter API. Load TwitteR library in R environment. Call twitter API using OAuthFactory$new() method with ConsumerKey & ConsumerSecret code as input params. The above step will return an authorization link, which needs to be copied & pasted in the internet browser. You will be redirected to Twitter application authentication page where you need to authenticate yourself by providing you twitter credentials. After authenticating , we will be provided with a Authorization code, which needs to be pasted in the R console. registerTwitterOAuth(twitCred)#Register your app with Twitter. This package allows users to fetch twitter Data in real time by connecting to Twitter Stream API. We can obtain the package from here. Few important functions this package offers are: it allows R users to access Twitter's search streams,user streams, parse the output into data frames. filterStream() - filterStream method opens a connection to Twitter’s Streaming API that will return public statuses that match one or more ﬁlter predicates like search keywords. Tweets can be ﬁltered by keywords, users, language, and location. The output can be saved as an object in memory or written to a text ﬁle. parseTweets() - This function parses tweets downloaded using filterStream, sampleStream or userStream and returns a data frame. load("twitteR_credentials") # make using the save credentials in the previous code.